With most waited winter holidays just around the corner, now is the best time to take care of your easy after-holidays start at work with less headache, more pleasure, and all your passwords in place. 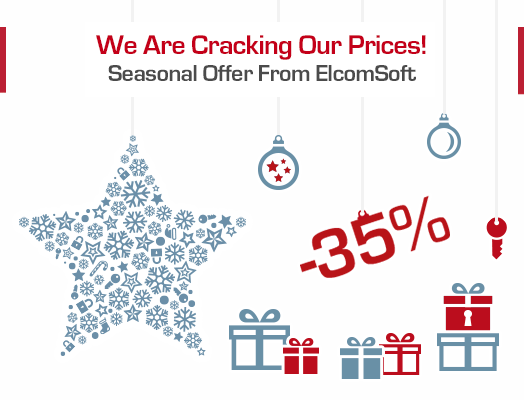 Elcomsoft Password Recovery Bundle includes all our software (except for Elcomsoft iOS Forensic Toolkit) and embraces all updates of the year. Elcomsoft Distributed Password Recovery, a high-end solution for big networked workstations added hardware acceleration for a number of file formats(see www.elcomsoft.com/edpr.html) on AMD Radeon HD cards (including 7000 series) and support for Tesla K20. Elcomsoft iOS Forensic Toolkit, an all-in-one solution for bit-precise physical acquisition of iOS devices got more flexibility on cracking the passcode in ‘Guided’ mode allowing you to detect the passcode type or perform the brute-force or dictionary attack with selected options. The toolkit also supports iPhone 5S and iPad 4 (jailbroken without passcode, non-jailbroken with passcode) for complete forensic analysis of devices’ contents. Elcomsoft Phone Password Breaker, an ideal solution for investigation of Apple and BlackBerry mobile devices added support for iOS 7 iTunes and iCloud backups, including keychain decryption and flexible iCloud downloading and quick downloading of iCloud backup data by selected categories. Advanced Office Password Recovery, an irreplaceable utility for home and corporate usage was speeded up in password recovery for MS Office 2007/2010 and 2013 with AMD OpenCL, NVIDIA CUDA, and NVIDIA Tesla K20. Elcomsoft Wireless Security Auditor, a unique tool to recover the original WPA/WPA2-PSK text passwords also added support for latest AMD Radeon R2xx cards, NVIDIA graphic cards, and NVIDIA Tesla K20. A ll our team wishes you a lot of new successful opportunities and greatest accomplishments in 2014!